Family Reach is the proud distribution arm of JUST TRYAN IT, a distinguished nonprofit that raises awareness and funds for families battling cancer through children’s triathlons. We sat down with JUST TRYAN IT Chairman Tim Moore for a Q&A on our partnership and how we’re working together to help more families remain in their homes, put food on the table and safely travel to treatment. How have you seen the financial burden of cancer impact families? Cancer does not discriminate. It impacts people of all ages, races, religions and socioeconomic statuses, through no fault of their own. A cancer diagnosis is one of the worst emotional and physical events in any family’s life. Can you imagine being in the impossible position of deciding whether to buy groceries for your family or pay for medicine to save your child’s life? A small amount of financial relief to cover everyday expenses can make a world of difference. Incredibly, I have seen families once in financial ruin because of cancer come back to help other families in need. Tim high-fiving a young JUST TRYAN IT triathlete. Why is it so critical that we address the financial burden of cancer? Cancer treatment has improved significantly over the years, but is only effective if you stick to the treatment plan. Children of financially stressed families often skip treatment because they cannot afford it or do not have transportation. The results of this can be devastating. What makes JUST TRYAN IT’S children’s triathlons so special? The joy of seeing children of all ages swim, bike and run across the finish line is indescribable. I’ve witnessed a 12-year-old boy push and pull his younger sister with cerebral palsy through our racecourse. I’ve seen six year olds giving it their all on bikes with training wheels. I have even watched my own son slow up at the finish line and allow a disabled triathlete to finish before him. 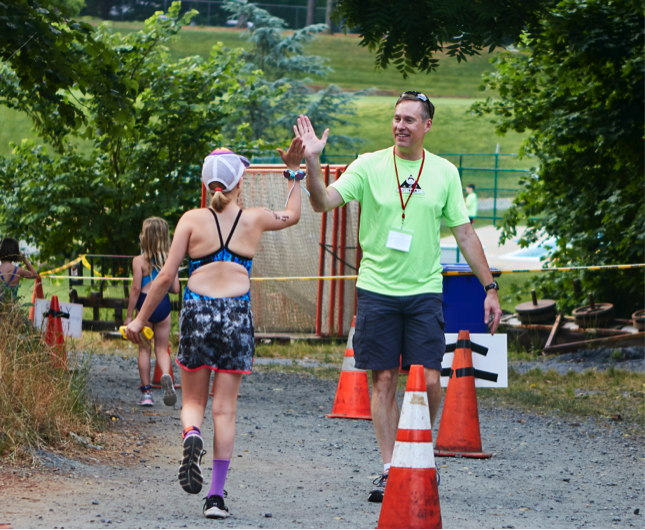 The triathlon format empowers children to take action and develop a sense of responsibility through fundraising and goal setting. It also promotes a healthy, active lifestyle. How does partnering with Family Reach enable JUST TRYAN IT to increase their impact? Cultural fit was also an enormous factor when it came to choosing Family Reach as a partner. Family Reach is like a member of JUST TRYAN IT’s extended family. Everyone there cares about the families that we collectively serve, and we could not be more thrilled with our partnership. Looking for information on how your foundation can partner with Family Reach? Contact Susan Marshall at smarshall@familyreach.org.